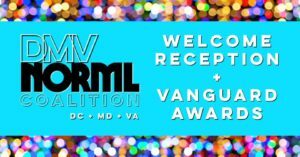 The DMV NORML Coalition, composed of DC NORML, Maryland NORMLand Virginia NORML, invites you to the Welcome Reception for the 2017 NORML Conference. You’ll enjoy an evening networking with activists from around the country, NORML leaders, and local legislators. The Coalition will present their annual Vanguard Awards to three lawmakers from the DMV who have significantly impacted marijuana policy reform.